Mt. Bachelor has posted maps and photos of trail progress for a new Downhill Bike Park! Woo hoo! Read more on the background of the project here, and check out more photos of construction here. Ok. So maybe not fair. But you know what this means for Mt. B!!!! We checked in on the live cams to see the action, but they were still registering conditions at about 5 p.m. Sadly we couldn't see all the snow we know is coming down. But the most recent conditions report said it was coming down hard and if the wind stays mellow, there'll be sweet powder to be had over the weekend. Yay for rain in Bend! Mt. Bachelor plans to address its current operating procedures. ...Where's there's a long line for the free Deschutes. Actually, this forum should be very interesting, given Bachelor's new spring operating hours and the recent Community B.O.M.B. Facebook group page. Check twitter (@sourceweekly) and our Facebook page for live updates. The Riverhouse convention center is packed! Tara loves rocks. And photography. After several consecutive weeks of attempting to successfully sport climb, I opted for something a little different. I heard once that being a bolt-jockey wasn't cool anymore and in order to get in touch with my grassroots as a climber, I needed to do what they refer to as "plugging gear." Although I initially had difficulty wrapping my head around the concept of how exactly one off-sets quick draws into holes and cracks, I realized later that it was much easier with the use of these widget thingys. Prior to my first real trad climb, I practiced my placements. My first route was the 5.9 crack next to Heinous. It went ok (see, I did not die) so I decided that I'd hop on the 5.11 around the corner, Wartley's Revenge. For the record, I found Wartley's Revenge to be extremely run out. It took about a half an hour of nearly falling and working my Elvis leg up the route to find one of those silver clippy thingys. Oddly, there were two right next to each other at the top so I just lowered down. In all seriousness, I was happy to pull off some trad sending on my first try. Placing gear is hard. That night…I dreamt about the route that made me want to learn to place gear in the first place — Palo Verde (5.12d/13a? Mixed route on the backside). Hopefully this means I'll be back there soon, or trying some harder cracks as well after lots of work. Next goal: Take some falls (how exciting!). I used these guys instead. Greg prior to nearly pulling off Scarface, 5.14a. Affording a camera at this point is pretty far off for me, but I really miss it. Voice your concerns and hear the word from Mt. B next Wednesday at the Riverhouse. Mt. Bachelor is not for sale. At least that's the word delivered to us from Powdr Corp. via Andy Goggins, Mt. B. 's Director of Marketing and Communications. However, Mt Bachelor has scheduled a community forum to discuss a local Facebook based movement that aims to wrest control of the mountain from Utah-based Powdr Corp. The "Community Buy-Out of Mt Bachelor" Facebook group is already 1,500-plus strong with members saying they are fed up with what they see as shortcomings on Bachelor's part. The group proposes making the mountain a non-profit, with the funds coming from community members. Lift breakdowns, poor plowing, lack of locals' discounts and poor customer service are among the complaints listed on the page and heard around town. Of the community group, Goggins says that "we’re keeping at eye on it" and hopes that next week's forum will clear up what he calls, "misinformation." Goggins said that "we've had a rough winter," due to severe weather that has hampered lift operations and in one case prevented the mountain from opening for an entire day. He reiterated, however, that Powdr Corp. has no plans to sell. Share your concerns and hear Mt. Bachelor's response at the open forum, hosted by Mt. B at 6pm on Wednseday, March 21 at the Riverhouse. The Community Buyout of Mt Bachelor has been formed to create a discussion forum and efficient communication link between the members of the Central Oregon community that would be interested in seeing Mt Bachelor become a community owned, financially viable, not-for-profit organization that is dedicated to providing a significantly better experience to local and non-local guests. By eliminating the profit motive of a corporate owner (Powdr Corporation), Mt Bachelor can be liberated to revise its operations for the benefit of its patrons and the Central Oregon community as a whole. A short list of desirable changes might include extending the snowriding season to begin earlier and end later, increasing the daily hours of operation, increasing the lift operation schedule to run ALL of the lifts that are possible, preventative lift maintenance (not disruptive "break-fix"), improving the quality of the food & beverage services, adding summer activities such as lift served downhill mountain biking, major concerts and festivals, and adding other amenities and programs that would help to make Mt Bachelor a truly extraordinary destination. The possibilities are endless. We can re-invent Mt Bachelor!! Since the time that Powdr Corporation acquired Mt Bachelor, locals have complained about a systematic reduction and degradation of mountain operations and services, the obvious purpose of which has been to reduce expenses in order to improve profits for Powdr Corporation's owners. If Mt Bachelor were community owned, operating priorities would strive to balance financial viability with the best interests of the season pass holders, day pass holders and the Central Oregon community. Success would be redefined from profits to STOKE!!! 1. ADD MEMBERS to this group so that we can form a large and connected base of support. PLEASE INVITE YOUR CENTRAL OREGON FRIENDS TO JOIN THIS GROUP!!!! 2. ASSESS INTEREST among our community in participating in a Buyout in which a few thousand people would contribute, say $5,000 - $10,000 each, in exchange for an ownership share in the new not-for-profit version of Mt Bachelor, and a LIFETIME SEASON PASS. 3. 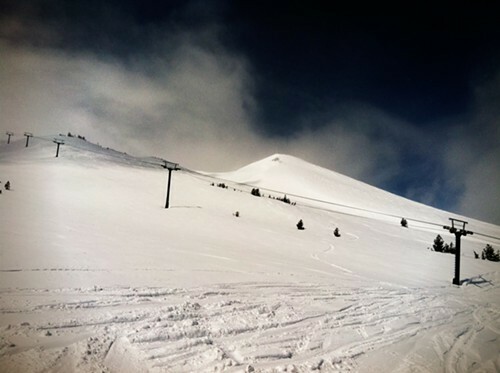 ASSESS POWDR CORP's RECEPTIVITY TO SELLING MT BACHELOR and their required terms of sale. Note: We shouldn't underestimate the influence that several thousand current season passholders could have, if organized, upon the terms of a Buyout, or upon Powdr's willingness to sell. In effect, WE CAN PERSUADE THEM to "see things our way" because we hold significant influence over their business results. We are their customers. They NEED US and they can not succeed without us. They have had their chance to operate Mt Bachelor and they have shown us very clearly what their priorities are. Our bad. Looks like Greg was scheduling a town hall right under our noses. Next up, a web cam rally! Update: Mt. Bachelor is reporting that the 35 inches that they recently received set a new record for total snowfall within a 24-hour period. After months of unanswered snow prayers this week’s storm has apparently over-delivered. Avalanche danger, a power outage, high winds and difficult road conditions prompted Mt. Bachelor to take the unusual step of closing the mountain for the day. According to Mt. Bachelor’s website, the resort has received over 35 inches of snow in the past 24 hours. While powder junkies might be tempted to poach some of that new fallen snow while the lifts sit idle, the resort has advised the public to remain off the mountain while crews conduct avalanche operations. The mountain is running on back-up power today while crews perform maintenance operations. The staff hopes to have the mountain open tomorrow by 9 a.m. but is advising skiers to check with the website before departing in the morning. Not everyone is as hard hit as Bachelor. Hoodoo is up and running, according to Marketing Director Leif Williams. While the winds are up, there is plenty of new snow to be had (18 inches over the past day) with a rain and snow mix falling presently. So leave the scotch guard Levis at home, grab your Gore-Tex and get some turns. Registration for the snow skate jam is at 11 a.m. Slopestyle event begins at 1 p.m. and downhill at 4:30. Let is snow, more is on the way. It's snowing, which is awesome. Mt. Bachelor is reporting 4 inches over the last 12 hours, but we've heard reports from folks who were up there today and said they found 12 inches of fresh in some spots. More is on the way (see below) and don't forget about Hoodoo, which is expecting even more snow that Bachelor over the next 12 hours (see even further below). A fun little video from Lahaina's Beau Killett who shot this footage up at Bachelor and then added a Bavarian twist to the production. Personally, we think the soundtrack is what makes this thing work. Mt. Bachelor announces it will wait until Thanksgiving to open. If you live in Bend and haven't been outside lately, let me fill you in on something: it is incredibly, insanely, mind-blowingly windy out there. And that same wind has caused Mt. Bachelor to announce this morning that they will not be opening for the season tomorrow, as previously planned. The winds are even higher up there on the mountain than here in town and are forecast to continue tomorrow. With that in mind, Mt. Bachelor is planning on opening on Thursday, Thanksgiving Day, when the weather is looking far less threatening. According to communications manager Andy Goggins, winds are expected to top out at 85mph at the top of Pine Marten tomorrow. Yikes. He's calling this "one of the worst wind storms we've seen in recent history." Considering you'd be getting your face blown in if you were up there, it's probably a good thing the mountain decided to wait. And on the plus side, Mt. B got hammered with another foot of snow over the last 24 hours, pushing the base up to 37 inches.